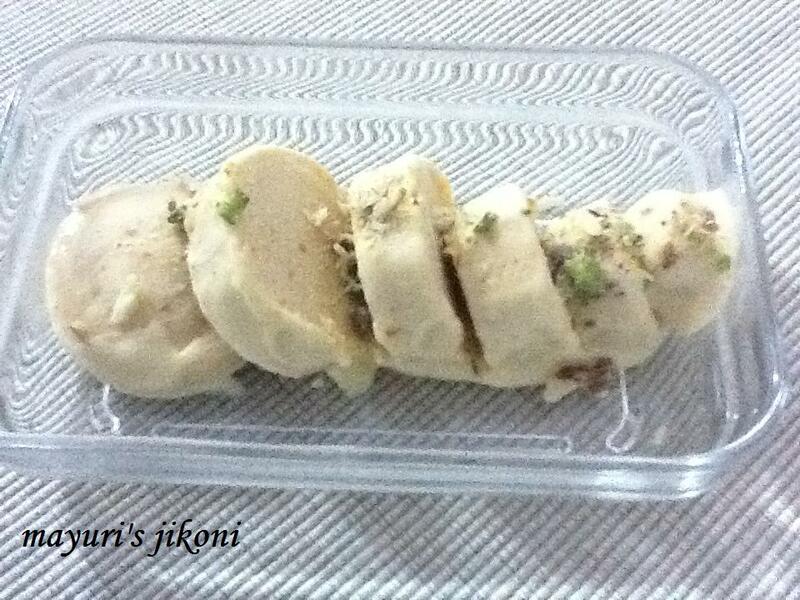 Kulfi is a frozen dairy based dessert very popular in the Indian sub continent. It usually has flavourings like rose, kewra, cardamom, saffron etc. It can have a fruit puree in it or just plain. Traditionally its made by boiling milk till it becomes thick, but this recipe of kulfi is a quicker version. Kulfis are more dense and solid than normal ice cream. Makes 6 to 8 depending on the size of the kulfi mould. Cut ripe fresh mango and puree it in a liquidizer using a little bit of the measured evaporated milk. Mix cornflour in about 2 to 3 tbsps of the measured evaporated milk. In a heavy bottomed pan or a non stick pan, pour the remaining milk and bring it to a boil. Remember to stir the milk occasionally. When it is boiling, add the cornflour paste while stirring all the time. Keep on stirring till the mixture becomes thick. It will reach the consistency of pouring custard. Add sugar. Mix and let it cool. Whip the cream till it is fluffy but not stiff. When the milk mixture becomes cold, add the mango puree, whipped cream and cardamom powder. Mix well. I usually mix it well with a hand blender. Pour into the kulfi moulds and let it freeze in the freezer. Just before serving, dip the mould in water and run a knife round the edges. The kulfi will come out easily. If the mango is sweet then you may need only ½ cup of sugar. Can also add saffron before freezing the mixture. Serve with finely chopped fresh mango. If you don’t have kulfi moulds then use popiscle moulds or ice lolly moulds. Make sure you use a heavy bottomed pan or a non stick one as evaporated milk tends to stick to the bottom. Add any other fruit puree instead of mango. The colour of the kulfi will depend on how yellow or orange the mango is.